On the same day in our Solar System, ESA published two beautiful images of impact craters from two different planets – Mars and Earth. 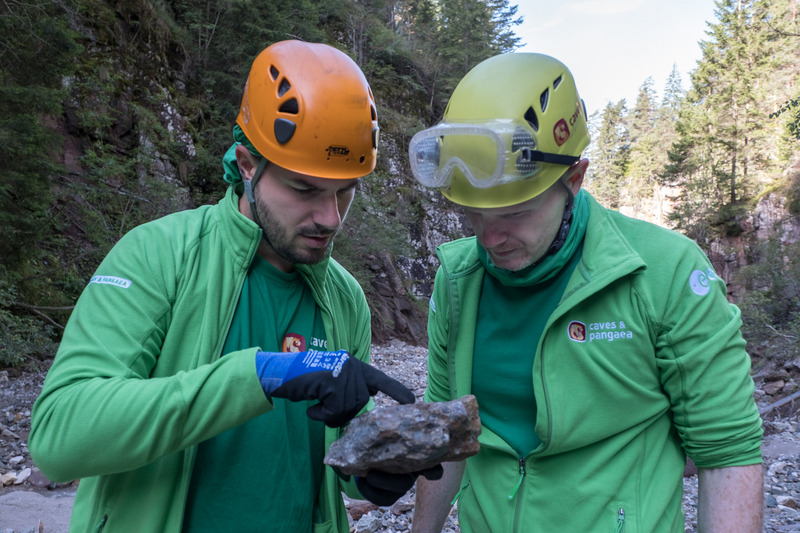 The features were so strikingly similar that we asked Pangaea instructor and geologist Ricardo Pozzobon to explain what the images could tell us about our geological history and why that could be important for the future of human exploration. Behind the transparent dome of a spacecraft module, a smooth, homogenous, flat surface fills the field of view. The monochromatic landscape is disrupted by subtle orange tints, all parallel. Small, darker rocks pepper the vast desert landscape. The pattern is suddenly broken by an out-of-context feature: a circular shape, with dark edges that cast a subtle shadow. It is almost completely covered by dust and desert varnish – a remnant of an ancient impact almost entirely filled by sand trapped within the depression. The ejection rays are barely visible. However, it is the kind of environment that a crew arriving at Mars would likely see. 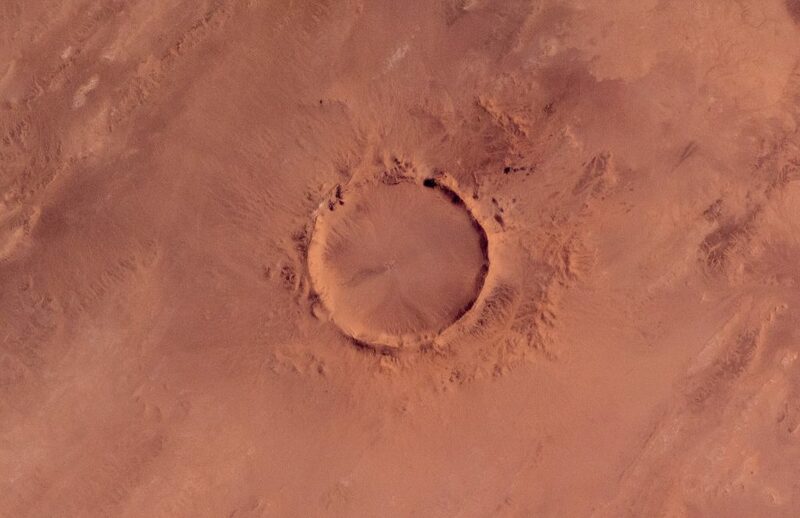 This picture of the 1 km-wide Tenoumer crater in the desert of Mauritania was taken by ESA astronaut Alexander Gerst from the International Space Station, 400 km above Earth. At about at the same time ESA’s Mars Express high-resolution stereo camera sent back an image of Cerberus Fossae System in Elysium Planitia – a huge volcanic province just above the martian equator, from around 300 km of altitude. Here, the environment is not so different in terms of shapes. Several large craters are surrounded by ancient lava flows and covered by dust to the point that only the rim is visible. The long narrow black line on the left is a deep tectonic fracture, much more recent than the craters it crosses, and it acts as a basaltic sand trap filled by the wind. It is the source for the dark dune visible inside the bottom right crater. These parallel sets of hundreds of km-long fractures suggest a more recent tectonic history. Mars is currently a cold, dry desert, with wind as its only active shaping agent. In the past most of the planet’s surface was shaped by water, volcanoes and impacts from asteroids. More than 4 billion years ago impact cratering shaped the pristine planet. Craters were up to hundreds of kilometres in diameter. Most of these are visible in the southern highlands – the area with the oldest terrains on the Red Planet. On Earth most large impact craters are not nearly as ancient as those on Mars and most have now been erased or degraded by atmospheric processes. The few that have been preserved are found only in the most stable conditions in the most ancient regions, such as in Northern Canada and Africa. The impact energy, shaping erosional forces and possible interactions with water can be better understood looking at Mars. 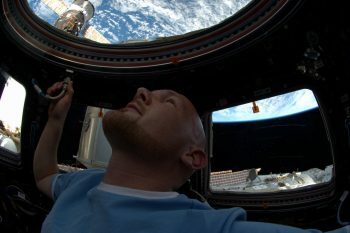 These two pictures perfectly capture the scope and spirit of Pangaea training for the future of space exploration. During Pangaea, astronauts are trained at sites on Earth that best simulate the pristine conditions on other planetary bodies. Participants are instructed how to read landscapes, interpret geology, and plan and perform operations knowing the major processes present in the environment, such as dust, volcanic rocks and impact craters. Mars provides the perfect laboratory for understanding the geological history of Earth, where signs of ancient impacts have been almost obliterated by plate tectonics and erosion. The pristine surface of Mars is not that different from Earth and it is frozen in time, bearing the signs of a common past that we need to unravel. When future astronauts look at Mars with their own eyes like how Alexander flew over the desert of Mauritania, it is exciting to think their exploration will also help to unravel ancient aspects of Earth’s history.